You can detox your body safely with our premier and alkalizing 9 pH Clay Vitality Detox Powder. 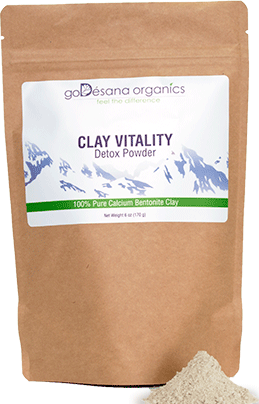 Clay Vitality Detox Powder draws impurities and excess oils from the skin, leaving it refreshed and purified. Its gentle and effective cleansing abilities make it perfect for removing make-up, and its softening benefits make it an ideal shaving cream. You won't find a smoother, finer, stronger, safer, all around more natural calcium bentonite/montmorillonite clay than Clay Vitality. Developed from weathered volcanic ash rich in trace minerals, Clay Vitality is a powerful agent of stimulation, transformation, detoxing, and transmission of energy that speeds cellular revitalization. all natural calcium bentonite clay has a drawing power of 32 times its molecular weight. This makes it ideal for use in deep cleansing, detoxing, clarifying of the skin, facial masks, body wraps, and many other uses. The two words are similar but their differences are fundamental to understanding how clay minerals function and how clay works. Clays that have the ability to absorb and adsorb, like Clay Vitality, are called living or active clays because they are capable of changing and exchanging. Adsorption describes the process by which the charged particles of other substances combine with the charged particles on the outer surface of the clay molecule. Think of it as a magnet, good attracting bad, holding it like a sponge and expelling it as the body normally expels toxins (sweating, breathing, bowel movements and urine). The positively charged ions are attracted to the stronger, negatively charged surfaces of the clay molecule. An exchange reaction occurs in which the clay mineral ions are swapped for the ions of the positive charged substance. The clay molecule is electrically satisfied and binds with the substances capturing them. Absorption is a slower and more complex process. All absorbent clays have a charge on their inner layers. This means that charged ions sit between the layers of the clay molecule surrounded by water molecules. The expanded clay attracts foreign substances that are absorbed and fill the spaces between the clay molecule's stacked layers. Absorbent clay will absorb positively charged ions and impurities and ignore negatively charged nutrients. Every piece of bentonite clay retains a considerable amount of energy from the large and powerful magnetic entity of the Earth from the volcanic eruption; its negative ionic charge. This electromagnetic action transmits an extraordinary strength to the body's cells and helps to rebuild vital potential through the liberation of latent energy. * Mix 1 teaspoon Clay Vitality Detox Powder to 16 ounces of water. Drink throughout day, leaving 4 ounces for consumption before bed. * The ratio for making a cleansing clay mask is 1 part dry clay to 3 parts water. This is also referred to as hydrated clay. For example, add 1 1/2 cups of water to 1/2 cup of Clay Vitality Detox Powder. Use a glass, ceramic, or food grade plastic container with a non-metal, air tight lid. Cover and shake vigorously for 1 minute or until all lumps are gone. * Store at room temperature with lid securely tightened. consult with your health care provider before use.